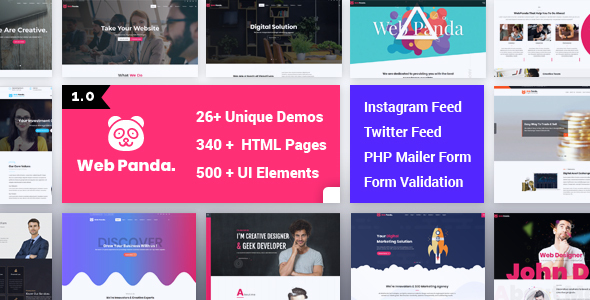 WebPanda is a highly creative, interactive, easily customizable, highly modern, fast loading, search engine optimized, efficiently coded, well documented, vibrant and fully responsive HTML5 and CSS3 multi-purpose website template for corporate, agencies, freelancers, individuals as well suitable as per the businesses domain. We have created to show their company history, services, work portfolio and projects, team, blog in most creative and professional looking manner using more than 26+ ready home page layout including one page website and also including as per business industrial service. What is inside in the magic box? An awesome collection of beautiful HTML5 templates for your next great website. Choose any of these and make it yours. We have created wide range of portfolio to show your work with Grid, Masonry, Metro, Justified and many more style. We have created more portfolio single page to fully showcase your products and accomplishments. We are not create just the homepage, We have designed many different beautiful and elegant portfolio onepage and single pages as per your needs. WebPanda comes with Massive elements collection for all imaginable scenarios. We have created 500+ elements and each elements have more wide range of variation style for create your website with desired look. We have designed and integrate social live feeds for get social updates with in a second on your website. We have created creative & elegants blogs layouts page to fully show your website news and updates. Pick the best header and stylist navigation from our variations collection of herader. Pick the best creative & stylist footer for your website. WebPanda’s hundreds of easily customizable and absolutely scalable options, enjoy the unlimited possibilities that you always desired. 26+ home page demos including one page home page. Beautiful and various header styles like transparent, white, dark, top bar, center navigation, centered logo, top logo, hamburger, left menu and centered navigation. Stylish and business friendly innerpages to suitable for your business domain. Sophisticated and SEO optimized page title styles with title, summary, breadcrumb navigation, image and video background. Full customize to read and highly intuitive blog post page styles covering all post types like standard, image gallery, slider, video, audio and block quote. Page layouts with one column, 2 columns left and right sidebar. Font Awesome, Themify, Et-line & dripicons font icons. Working ajax and PHP contact forms with from data validation includes business email template for email impression. Megamenu with fully customize and user friendly navigate. Sticky header navigation, custom navigation and many more creative user navigation. Smooth parallax scrolling sections include parallx effects. Lightbox with video & audio functionality. Onepage smooth scroll ready for one page navigate. Huge level of shortcodes and elements for create different styles and unique website using of that. Tabs with different style variations, including horizontal and verticle tab. Instagram feed for instagram updates. Twitter feed for twitter updates. Rotating image and content boxes. Stylish hover box for re-present unique section. Heading styles and drop caps. Pricing tables with various type of creative style. HTML5 with google semantic code with proper naming of classes. Well structued CSS, JS & Images with appropriate naming convention. Fully theme element built with .scss files. Perfect detailed documentation with better understanding of template, template usablity and features. professional help quickly. Expect a response Monday to Friday 10:00 to 18:00 (GMT +5:30) within 1 business day. Our team is open to our customers and aim at getting better! We are a expert and trusted team of full-time developers having 7+year experience. Sharing the same goals and putting our best knowledge into what we do make us successful. One of our priorities is to bring the feeling of satisfaction with our items to the clients! So you can always rely on us! We introduce new updates and features regularly. Just check for our version histroy. This is a pure HTML5 templates, not a WordPress or any other CMS theme. already in your main file. item, I’ll appreciate it very much!….Thank you.